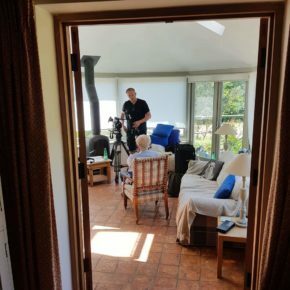 Back in early July 2018 my friend (and talented cameraman) Patrick Tyndall and I drove into the English countryside to visit a gorgeous, secluded cottage to meet a film legend. Slap bang in the middle of the hottest and longest summer I can remember in the UK (not that I travel abroad extensively from March to November each year, so I often miss the sun here! ), we entered the charming property to find our interviewee sat in a comfy chair in his conservatory, a few little dogs scampering around at his feet. Robert Watts, a 60 year veteran of the film industry had agreed to give us an hour of his time to chat about his lengthy career. I’ve grown up watching Robert in a number of documentaries from the original 1980 making of Raiders to the brilliant Kevin Burns Star Wars documentary of 2004 “Empire of Dreams”. Robert always came across as a fun interviewee in those docos. And I can now tell you, from the horses mouth that this is indeed true. Paddy and I had a blast chatting to Robert. In fact our only regret was not being able to have longer with him.